Add onion, and sauté until soft, about 5-7 minutes. The add sweet potato, tomatoes, and beans (don’t add the seasoning packet yet) and water and bring to a boil. Lower to a simmer, cover tightly, and simmer for 2 hours or until beans are tender, stirring occasionally. Once beans are tender, add seasoning packet and chili powder, stir, and simmer 10 more minutes. 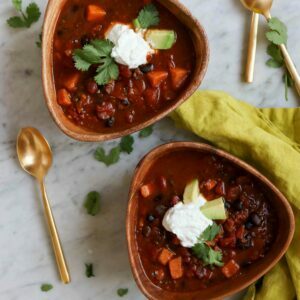 Serve hot with avocado, sour cream or (thick coconut milk to keep things parve) and cilantro for garnish. Make ahead: chili can be made up to 5 days before serving. Garnish right before serving.